It is often said that foundations can take risks that others cannot – but do they in practice? 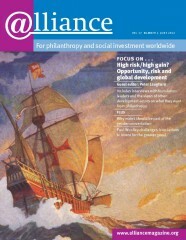 This issue of Alliance looks at opportunity and risk, and what philanthropy can gain from taking calculated risks. Guest editor Peter Laugharn concludes that foundations should push themselves further to identify the most promising opportunities and take risks to attain them. What are the real risks in philanthropy? For the Rockefeller Foundation’s Zia Khan, the real risk is not realizing the potential of your grant dollars. For Johannes Meier of the European Climate Foundation, the biggest risk is that foundations become irrelevant because they don’t tackle the big issues. Discussing the best approach to opportunity and risk, Lance Fors suggests we look to attitudes in the private sector, while Pesh Framjee comes up with a ‘heat map’ tool to assess risk. The special feature concludes with the views of other development actors – including governments, NGOs, the World Bank, UNDP and the UK’s Department for International Development – on what they want from foundations. Also included in the June issue of Alliance: Paul Woolley offers suggestions for foundations looking to achieve better long-term returns on their assets while at the same time helping to reform the financial system; a reminder from Françoise Pissart that men and boys should be included in gender approaches; and an interview with Aryeh Neier as he steps down as president of the Open Society Institute; plus more articles, letters, book reviews, opinion and global updates. A role model for the good ship philanthropy? Are foundations more risk-averse than necessary? 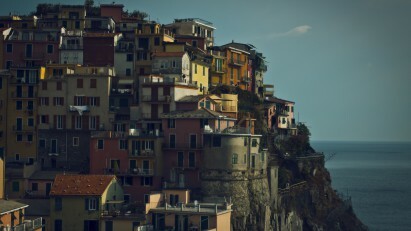 What do others want from foundations? African Grantmakers Network – What’s New, What’s Now, What’s Next?